Don Givens was a striker who started his career at Manchester United in 1966 in the youth team. He had his professional debut in 1969 playing 8 games and scoring 1 goal in one season. He transferred at Luton Town where he played two seasons and scored 19 goals in 83 matches. He then joined Queens Park Rangers in 1972 and here he played six seasons, scoring 76 goals in 242 games. He ended his career after spells at Birmingham City, Bournemouth, Sheffield United and six seasons at Neuchâtel Xamax. Givens also capped for Ireland 56 times and scored 19 goals. Givens was big and powerful but extremely mobile at the same time, looking to be a complete forward. 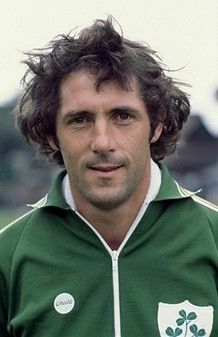 He scored two hat-trick with Ireland and even four goals in a match against Turkey in 1976. In a match against URSS he scored two fine goals with the head. He used both feet, had decent speed, agility and dribbling, good ball possession and nice passing, in fact he often came back to the midfield to take the ball, passing it to a teammate and run towards the opponents' area.